The One Love Peace Concert was unlike any show that's ever gone down in the States because of its political impact. In 1978, Jamaica was in the midst of a bloody civil war between the Jamaican Labour Party and the People's National Party. 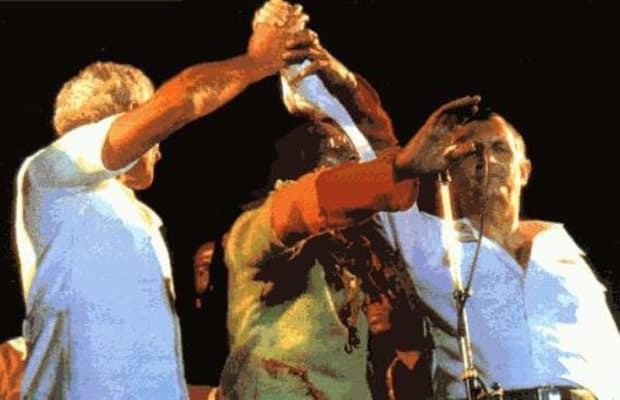 Frustrated by all the bloodshed, Bob Marley heroically united the warring factions when, during his performance of "Jammin," he actually got the leaders of each rival party, Michael Manley (PNP) and Edward Seaga (JLP), to join hands onstage. Although Jamaica is still afflicted with violence, we just wanna jam out with Bob's hologram and not worry about getting shot over who we're voting for. If there is a Marley hologram, hopefully it can be beamed up to Amsterdam or Humboldt County or somewhere irie like that.